Making one healthy meal isn’t that hard. Keyword: one. Doing it over and over again, every single day, is exhausting and honestly impossible for a lot of us. When we get home, we’re too exhausted to spend an hour or more in the kitchen making a meal for ourselves and perhaps even our families. Maybe we wouldn’t have the time even if we wanted to. That’s why meal planning is so important. But meal planning takes a lot of time too, doesn’t it? Not when it’s already done for us! The Forks Over Knives Meal Planner is saving people time and money everywhere, giving them everything they need to sustain a healthy, plant-based diet. With this service, we won’t be left feeling like our kitchen is a jail cell and we’re serving time instead of dinner. With Forks Over Knives, we can “take the guesswork out of what to cook each week” and have every meal prepared in 35 minutes or even less! See it: Try the Forks Over Knives Meal Planner starting at just $2.30 per week! Pay $20 per month or save 50% by getting one year prepaid for $120! Also, try a two-week sample plan at no cost! A plant-based diet has been shown to prevent or reverse chronic conditions such as high cholesterol, heart disease and type 2 diabetes and we may see those very same benefits. On top of that is the benefit of eating a delicious meal we made all by ourselves! One customer said they “hardly ever eat out at restaurants anymore” since trying Forks Over Knives because of the ease of cooking and the resulting satisfaction of eating! When we sign up, we can choose the type of plan we want, listing if it’s just for us or others too, if we have any allergies and if we want to add on a breakfast option. 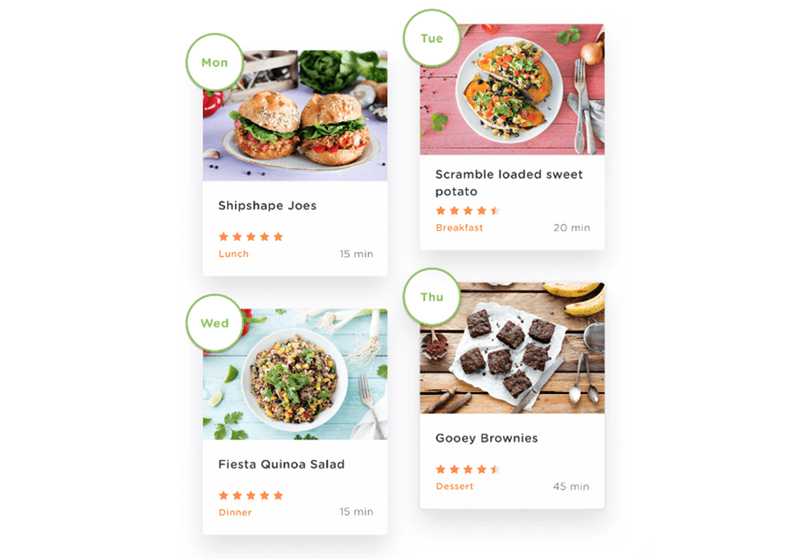 We’ll then be taken to our meal-planning dashboard, which is updated every week with a five-day meal plan with recipes chosen just for us! Each day features a lunch and dinner option, but along with breakfast, there are also snack and dessert options. The plan is totally customizable to suit our diet and mood. We can swap out a meal, choosing among hundreds of other options, or drag and drop meals to different days and times instead. We can click into each recipe to see detailed instructions and tips. Often, Forks Over Knives will suggest making more than one serving so we can have leftovers for later in the week. Leftover meals are marked with an “L” on our dashboard. This way, we can spend even less time chopping, slicing and boiling away in the kitchen! To save even more time, there is an optional weekend prep section, which guides us through batch cooking in advance so we can prepare things like grains or noodles for the rest of the week! So if we’re going to cook all of these yummy meals, we’re going to need some ingredients, right? Just click into Grocery List to find everything we need laid out in front of us. We can sort ingredients by aisle or by recipe, whatever works best for us when we’re shopping. There’s also a Pantry Items section, which includes ingredients we might already have in our kitchen, like spices, vinegar, oil or sugar. Whatever we have, we can check off in advance. There’s also a Notes section which gives us substitution options, ingredient explanations, brand recommendations and storage tips, for starters. When we’re shopping, we can either bring our list printed out or open it up on the Forks Over Knives app or website on our phone and check everything off as we toss it into our cart! Visit the Recipe Box for inspiration or to browse other meals we’ve tried and loved or haven’t made yet. The recipe selection is vast, ranging from BBQ Sweet Potato Tacos, to Vanilla Fruit pudding, to Pizza Baked Gnocchi to Pumpkin Pancakes! Sorry, our stomach just rumbled. Along with their Meal Planner, Forks Over Knives also has their own little shop, featuring meal kits, dressings, books and DVDs all available to help us prepare the best meals for ourselves and our families and ultimately feel our best, too. We’re also really loving the idea of how amazing we’re going to become at cooking throughout all of this. Chef Us, reporting for duty!